Giuseppe “Peppino” Meazza, also known as il Balilla, was an Italian footballer playing mainly for Internazionale in the 1930s, scoring 242 goals in 365 games for the club. 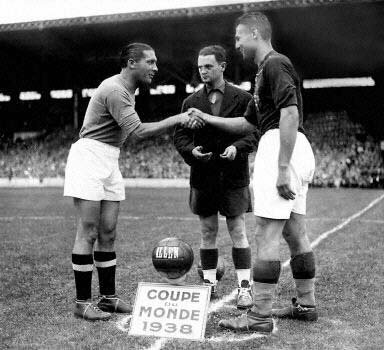 He led Italy to win two World Cups: in 1934 and in 1938, winning the Golden Ball Award in 1934. He is widely considered the best player of his generation, and one of the greatest of all time. He has been ranked fourth-best player in the history of World Cup. 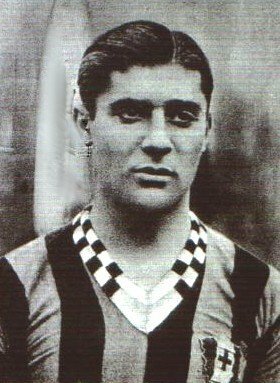 His nickname, “il Balilla”, was given to him in 1927 by his older teammate Leopoldo Conti, who thought “Pepp”, who was only 17 when he joined the senior team, was too young to be associated to the senior team, and was surprised after Inter coach Arpad Weisz decided to give Meazza his debut for Inter in his place. “Now we even take players from kindergarten!” exclaimed Conti sarcastically. 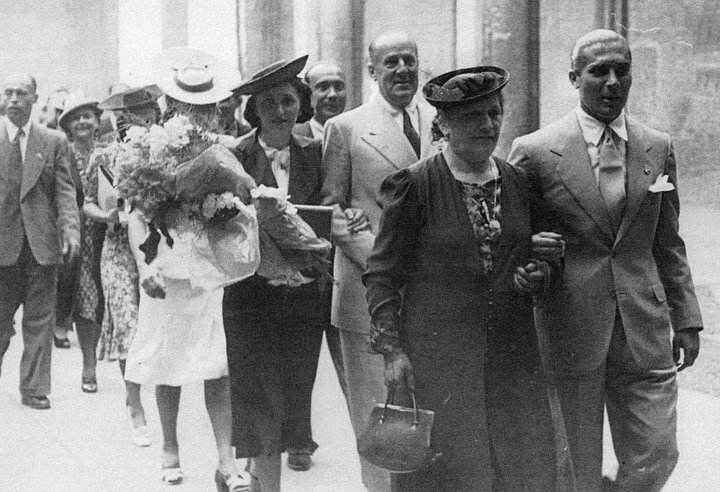 The National Opera Balilla, the Fascist youth organisation which collected all children aged 8 to 14 years, was established in 1926 and so Conti thought it a good way to describe the young rookie. 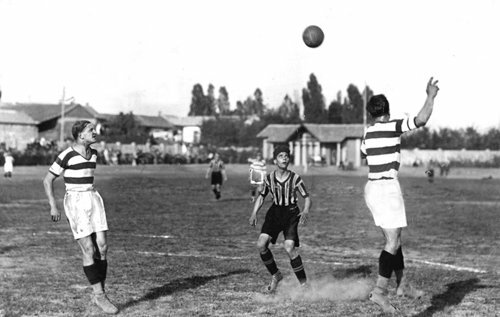 Meazza scored two goals on his debut in a 6–2 win against Milanese Unione Sportiva in the Coppa Volta in Como, leaving old “Poldo” Conti speechless The “Gazzetta dello Sport”, the day after his official debut in the Italian championship on 12 September 1927, praised his game “intelligent, fresh, quick”, something that didn’t happen very frequently during those days. 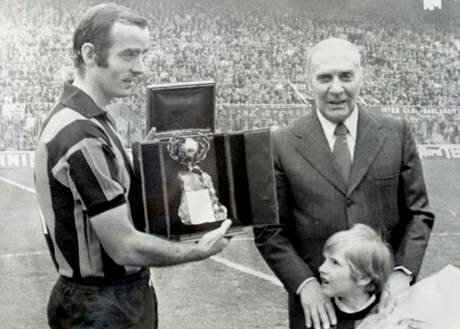 Meazza was born in Porta Vittoria, Milan. 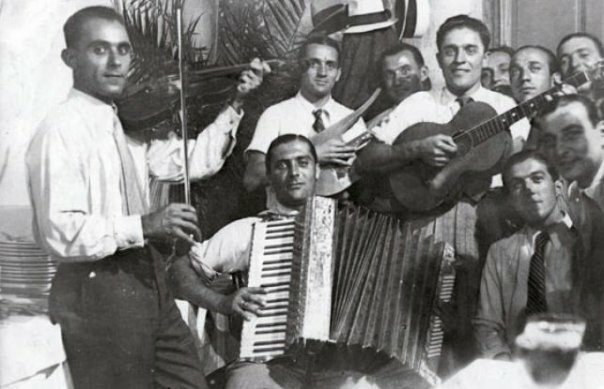 Having lost his father in 1917 during the tragic fighting of World War I at the age of seven, young Peppe grew up in Milan with his mother, Ersilia who came from Mediglia, helping her sell fruit at the market. However, it was football that was his true calling. His mother hid his shoes so he would not waste his time, so young Peppin learned to play barefoot. He began playing at six years old on the streets on a team named the “Maestri Campionesi” who played with a ball made of rags. At twelve years old he finally got permission from his mother to pursue being a footballer, and began playing for Gloria F.C.. It was here that a fan bought him his first proper pair of football boots. 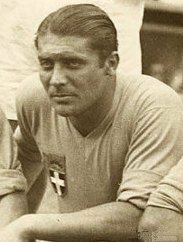 Meazza was the first Italian football player who became famous worldwide, and was the first player with personal sponsors. 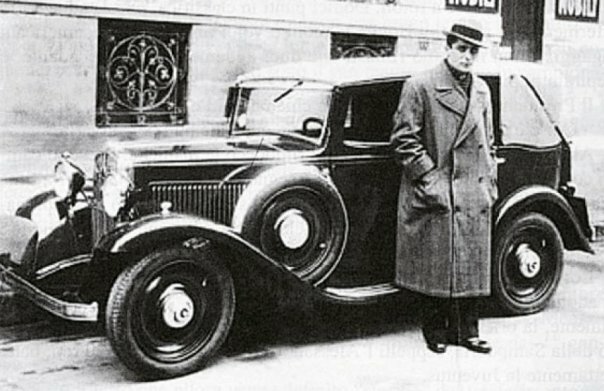 He loved his cabriolet, champagne and women and was the only player on the national team that was allowed to smoke. Sometimes he would not get out of bed until his teammates were already done practicing. He also loved the Tango and used this proficiency to make him unpredictable on the field and could score goals at fox-trot tempo. The content of this page were taken in part from the Wikipedia article Giuseppe Meazza. The full list of those who have contributed to the original article is available at the history tab of the article.